You are here: Home / Galaxy Note 4 How-To Guides / How to use Galaxy Note 4 download booster? What can Galaxy Note 4 download booster do? 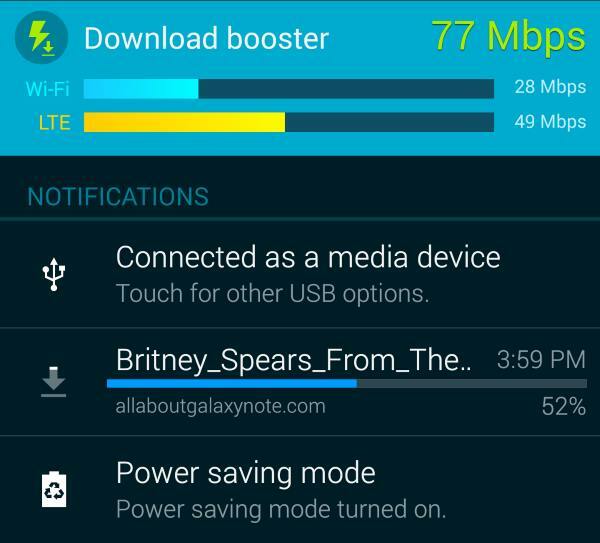 Samsung first introduced the download booster in Galaxy S5. This feature was later introduced to Galaxy Note 3 in the Android KitKat 4.4.3/4.4.4 update. In Galaxy Note 4, Samsung slightly updated the download booster. What download booster does is to combine 4G LTE connection and WiFi connection for one file downloading job. So, you get faster download speed because both 4G LTE and WiFi connections are used simultaneously. Normally, you will not use WiFi and mobile data at the same time. If WiFi is connected, mobile data will be suspended automatically to save your data. Please note, if your mobile plan does not include many data, you may not want to enable download booster, because it may deplete your data quota very quickly. How to enable Galaxy Note 4 download booster? One way to enable Galaxy Note 4 download booster is from quick settings panel. Swipe down from the top of the stats bar with two fingers to access quick settings panel. Tap Download booster to enable it if it is not shown as green. 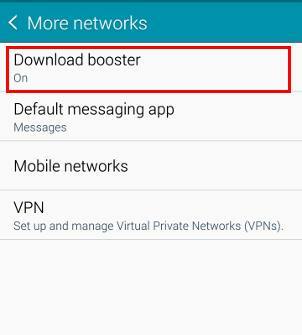 Another method to enable download booster is from Settings –More networks–Download booster. In the download booster page, drag the switch to the right to turn it on (green). If you want to turn it off, drag it to the left. How can I know whether Galaxy Note 4 download booster is working or not? At the same time, in the notification area, the total download speed, 4G LTE download speed, WiFi download speed, and download progress will be shown as below. What are the benefits of Galaxy Note 4 download booster? The major benefit of using Galaxy Note 4 download booster is the speed. You can finish the download earlier than using WiFi or using mobile data alone. But it is not the simple addition of two connections. There are about 10-20% overheads. This means if the connection speed to the download server through WiFi and 4G LTE differs significantly, you will NOT see any benefits. So, Galaxy Note 4 download booster works best when the two connection speeds are close. The speed refers to the download speed from the server, not connection speed to your ISP. Why Galaxy Note 4 download booster is not triggered in my phone? Sometimes, even after you enable download booster, mobile data and WiFi, you may find the Galaxy Note 4 download booster never is used. The size of the file to be downloaded is less then 30MB. Your area is not covered by 4G LTE. The speed (to file server) difference (between 4G LTE and WiFi connection) is too large. The downloading job is launched and running through apps other then web browser. 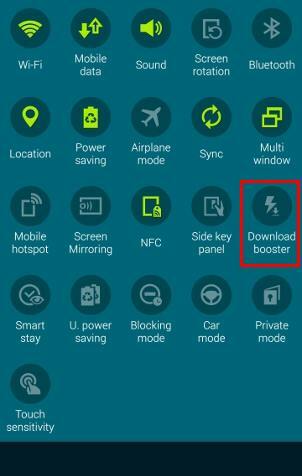 Why I cannot find download booster option on my Galaxy Note 4? Galaxy Note 4 download booster works with 4G LTE only. If your Galaxy Note is a 3G model, there will be no download booster option. 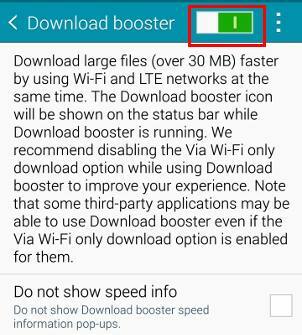 Some carriers or distributors may also disable or hide download booster in LTE models of Galaxy Note 4. Can you use Galaxy Note 4 download booster to get faster downloading? If you have any problems or questions on using Galaxy Note 4 download booster, please let us know them in the comment box below. We will try to help you find a solution. For some reason the WIFI indicator on the top bar is not showing anymore. It connects to Wi-Fi but the icon disappeared. How can I get the icon back on the top bar? Did you root the phone? You can try to reboot the phone to see whether it helps. I’m Janvier .I’m in central Africa(Rwanda).I have Galaxy not4 SM-N910H but I can’t get 4G LTE in my phone.I tried all possible but nothing change.What can i do to get it. Does your carrier offer 4G in your area? Does your mobile plan include 4g? When I try & use the download booster lately it keeps telling that it is not supported by server. The file I’m downloading is over 800 mb. The website you are connecting to does not support it. Some webmasters only allow single connection without resuming. Recientemente obtuve un Samsung Note 4 atraves de Sprint. Hago una inversion porque mi interes era obtener un equipo con los mejores estandares de calidad. Pero para mi decepcion Samsung y Sprint nos han tomado por tontos vendiendonos una undidad que no reune los estandares por los cuales hace su promocion. Sprint nunca ha tenido labtal mensionada señal 4G asi que menos podra tener LTE y ahora Samsung pronociona una funcion para mejorar el rendimiento en el internet pero a discrecion del proveedor de servicios. Nunca he tenido un celular de Apple pero pienso que ellos no arriegarian su credibilidad de esa forma. I think it has 4g LTE. Do you have the download booster option? The carrier may remove or hide this feature. I use wifi at home. If the booster is enabled and I’m at home… Will the download booster take data from my monthly wifi data package or my ISP mobile data package? … or both? Download booster uses both WiFi and mobile data. But it is used only when you are downloading files that are larger than 30MB. When it is used, the icon will indicate it. In that case it will be less expensive NOT using the download booster. I’ve N910P and didn’t find download booster. Where can I find out this options? Also I would like to findout whether N910P is 4G LTE phone? I think the n910p has LTE. But Sprint very likely blocked (hide) the download booster. Anyway, you can check the packaging box which lists major features. Download booster is only available on LTE models (usually it is 910G or 910F). N910H does not have LTE and therefore there is no download booster at all. Why is this advertised by Samsung and then allowed to be disabled by the carrier. Not cool since i bought phone based on abilities to download better than others and now its downloading same as my s4. Like and purchase only samsung phones since like the memoir cauae they hive all kinds of extras. Why i didnt evem consider the Nexus 6,yesbu get updates quicker but often unpolished anyway so i dont mind waiting especially when they cost almost the same but no bells or whistles lol ok in done just realized like idiot i didnt have this cause of sprint. The carrier can make such demands. The manufacture has to obey as long as the request is not illegal. Otherwise, they may block the handset in their network. it only works when you download files through download manager (browser). The file size must be larger than 30MB and 4G LTE connection must be available. I have used nova launcher to enable it on my note 4. but when i download apps it doesmt light up like on my previous phone. You may try to download a large file (>30mb) through Internet app. I recently purchased the galaxy note 4. I’m in the U.S.A. on AT&T. I used the anycut app to make a download booster shortcut. But the icon in the notification bar never seems to light up? I’m in an LTE area and am connected to wifi. When I go to my more networks tab in settings the download booster option is not there. 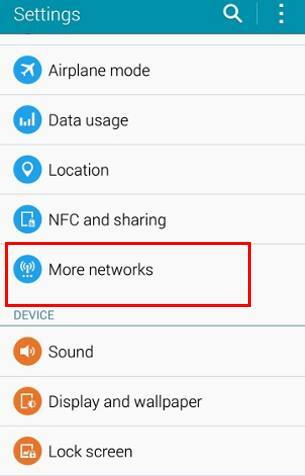 AT&T and some other carriers, actually “hide” Galaxy Note 4 download booster feature. It is still possible to enable it on your Note 4. You may try Nova launcher, tap and hold on the home screen, tap shortcuts–activities –settings–download booster. Now tap the download booster shortcut in the home screen and enable it.